But just because “best practices” are widespread doesn’t mean they’re effective. In fact, in many instances the opposite is true: best practices can be outdated, harmful, and a hindrance to innovation. These bad practices are all too common in organizations, and managers and executives are usually blind to their pernicious effects. Since the practices have worked in the past, or have been adopted with success by other firms, their purpose or effectiveness is rarely questioned. As a consequence, outdated or harmful practices spread and persist. 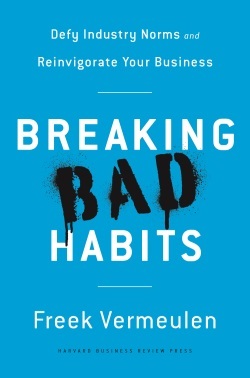 In Breaking Bad Habits, Freek Vermeulen, a strategist with a keen eye for the absurd, offers the tools to identify these practices and rid them from your organization. And, most of all, he presents a compelling case for how eliminating popular ideas, processes, and strategies can create new opportunities for innovation and growth. Brimming with examples of norm-defying organizations in an eclectic range of industries – including IVF clinics, hotels, newspapers, and an iconic London Theatre — Breaking Bad Habits will make you rethink your long-held beliefs about industry norms while encouraging you to reinvigorate your business by breaking out of the status quo. Freek Vermeulen of London Business School points out that perception bias, imperfect copying of methods, herd-like benchmarking against top-ranked rivals and an obsession with short-term results can sucker companies into bad habits. Like a virus, rather than killing their host quickly, bad practices linger long enough to be transmitted to others. “Breaking Bad Habits” is a strong book that gets up with “best practices” and tells us why it’s sometimes necessary to make changes without there being any rational reason to do that. Known issues are highlighted from brand new angles, and it provides a rare original management book. The book is easily read. It is not filled with heavy academic references. But he is one of the heavy strategy professors of London Business School. Those whose skin crawls when they hear, “It’s the way we’ve always done it” will find themselves nodding in agreement on virtually every page of “Breaking Bad Habits”. One of the key strategies for transforming business performance and increasing leadership effectiveness is simply to stop doing what’s always been done, says management guru Freek Vermeulen in his book ‘Breaking Bad Habits’. Breaking Bad Habits … contain[s] nuggets of insight and advice that are well worth mining. Freek Vermeulen’s Breaking Bad Habits is not the first book that explains why so-called “best practices” can end up being just the worst for organizations … but it is one of the best. In Breaking Bad Habits, Freek Vermeulen offers the tools to identify bad practices, eliminate them from your organization, and then move on to create new sources of innovation and growth by out-thinking your competitors. Pares back the corporate veneer with a scalpel and exposes how business really works. This is not a business book: it’s a fast-paced, mind-boggling book about business. What really goes on inside businesses? What covers them in glory – and what douses them in failure? What are CEOs really like? Who are the gods and who are the villains? How does money get made – and lost? How can success today mean failure tomorrow? What’s this strategy thing? Why do good businesses go bad? Business Exposed asks all the unspoken questions and reveals the surprising, sometimes shocking, answers. Wow, what a book! Every so often a book comes along that re-frames business. Business Exposed does just that in a fast-paced, smart read based on serious research. It’s fresh, informative, and funny, and chock full of insights that you won’t expect. This book is a delicious read. Freek Vermeulen presents us with a candy dish of witty reflections about the current state of management in a candid and disarming personal tone. His knack for cutting through to the essence of complex ideas and stripping them of a sometimes undeserved pomposity is truly impressive; it delivers an enlightening wealth of conversation starters for managers. Two thumbs up! Freek is one of those rare people who manage to combine real substance with flair, making complex insights highly understandable. He is one of those people who make you feel smarter. He offers a fresh, honest and atypical way to look at management issues that few people take the time to stop and analyse. This book will not disappoint you. Vermeulen decodes and translates business research with intelligence and wit. He uses his extensive knowledge of both research and the practice of management to compile a fascinating overview of the latest insights from management science. Business books often seem to have a questionable base to them, lacking solid evidence for their recommendations. Not this one. Business Exposed builds on facts and research. Freek’s style is hardly that of a stuffy professor though: it is fast, sharp and with a great sense of humour. Business Exposed is a delight! Using fast-paced analysis and insights from academic research as well as humor and plain common sense, it exposes the naked truth behind many of the things that we take for granted in business. In the process, it disropes the emperor of conventional wisdom to reveal how things really work in the strange business of business. Vermeulen is a master story teller and this book is a testament to that. It will change the way you think of business for good. If the role of CEO is chief storyteller, Vermeulen’s role is chief doubter. He is the boy laughing at corporate kings with no clothes on. But he makes sure we all laugh with him. And that we’ll never look at business in the same way again. Vermeulen has put together an amazing compendium of interesting, counterintuitive, and sometimes disturbing findings about management. He delivers the material in succinct, readable, and often humorous prose, and illustrates his points with compelling examples. The result is a uniquely valuable book that will be informative and entertaining to a variety of corporate “stakeholders”, which in the end includes all of us. This deeply insightful and in places controversial book will be of great interest to managers and observers of business. It does a wonderful job of distilling insights from research on human behavior and applying it to business to show how managers can sometimes systematically deviate from rational behavior. Professor Freek Vermeulen is that rare academic who not only has a great command of his field but also can make management research highly accessible to everybody. His book exposes the many silly things that go on in business; you can improve your performance greatly if you understand and correct those. Business Exposed is not only an eye-opener but also highly entertaining! If you’ve ever suspected that the account of business that we hear about in the media, with perfect managers and executives making rational decisions in the best interests of their customers, shareholders and staff is an airbrushed version of reality, then this is the book will confirm your suspicions. 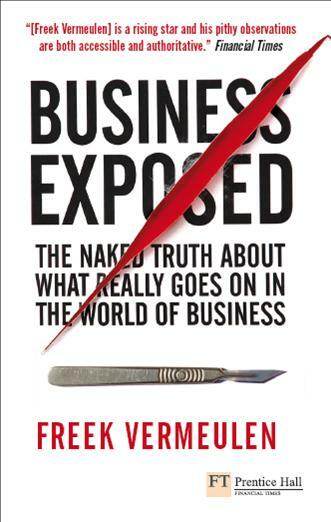 In Business Exposed, Freek Vermeulen has written the ultimate no-holds barred exposé of what really happens when the boardroom door is closed. Fiercer than a Dragon in the Den and better informed than Jeremy Paxman, Freek takes you on a searingly honest journey through the murky reality of business today.